To sustain the running costs of UGoGreen and not be dependant of external donations only, an income generating activity was set up: Plot 99 Coffeehouse and Lounge. 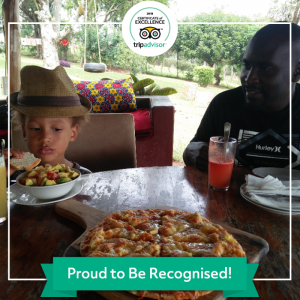 This much appraised restaurant in Masaka town offers a wide range of continental food, is a great meeting place and has the best view in town. According to the customers, the home grown and roasted coffee is the most delicious in Uganda! Plot 99 opened its doors in September 2012, giving life to its motto: making food with love. The customers feel this vibe and keep coming back for an all time favorite: pizza! Check it out on Trip Advisor, FB or Instagram.